In terms of its effect on other academic subjects, advanced reading is the most important subject. It is too easy to push reading aside for other areas of school or activities, because reading requires quiet, sedentary time, and often seems like too much fun to be considered "work." Yet, more than any other reading skills or strategies, students need reading stamina and perseverance. The best way to instill this is with pleasure reading of both novels and non-fiction: no book reports, no posters, no literary analysis, no comprehension questions, just good, enthralling pages read. Helen and Anna grumble (somewhat forgivingly) about my "phases." I read about some way of teaching or learning and excitedly introduce it into school. They try it out for a few weeks or months and it either becomes a permanent fixture, or we abandon it. Sticky notes were one such phase, and probably the most dramatic failure. So, I bought pads of sticky notes and told Helen and Anna that they should be marking up their books and sticking sticky notes in. Helen confessed to me this year: "It made me quit reading. I'd quite liked reading before that, but I hated the sticky notes." It turns out that she pretended not to read, and would steal away behind the woodpile to read as a secret vice, rather than face my assignments. Fortunately, I realized what I was doing to them before I ruined their love of reading. I thought back to my time in school, particularly in the second grade when I had to write book reports on every book I read. After two or three, I landed on a strategy of alternating two book reports. "I liked the story. It was funny" and "This was a good book. The pictures were cute." This saw me through second grade, but I realized there was absolutely no point to bringing this tedium to the next generation. I decided to drop all pretence of school reading, and simply encouraged Helen and Anna to read. It was so successful that at one time I had to ban "novels before school" because they wouldn't put the books down and do their math. I tried to take the long view, to remember that pleasure reading was what made me a scholar, but I was nervous. Where were the workbooks? Should they be writing about some of their reading? How would they do on reading comprehension tests? Shouldn't we be studying grammar? Vocabulary? The K-6 teachers and I make time every day for our students to curl up with good books and engage in the single activity that consistently correlates with high levels of performance on standardized test of reading ability. And that is frequent, voluminous reading. A child sitting alone in a quiet room with a good book isn't a flashy, or more significantly, marketable teaching method. It just happens to be the only way anyone ever grew up to become a reader. Atwell doesn't assign "reading slips, book reports, sticky notes . . . ." Instead, she talks to the students about the books they read, has them keep a list with ratings, give presentations to the class on books they recommend, and occasionally the students write letters to her or to each other about a book. I describe our school as having a "hands off" approach to reading, and I don't ask Helen and Anna to write letters or formally talk about the books, and they only rarely keep a list of books read, but I'm not completely ignoring them. I know what they're reading, and we do talk about the books, at a level similar to Atwell's letter. I buy books that I loved and recommend them, and Helen and Anna take out books from the library whenever we're near one (at last count I had a collection of nine library cards from four different countries). We have limited space on the boat, so we do all tend to read the same books, and we have all four of our digital readers on the same account, so when we purchase a book, we often all read it. It's a family version of a reading workshop, and, instead of being school work, the discussion simply happens at mealtimes or on a hike together. We were also extremely fortunate in having a friend take a great interest in the girls' reading. Wal sends them packages of books a couple of times a year ��� dozens of novels, quite often the first volume of a multi-volume series, so they could take it up or not as they chose. It's one thing (and a very important one) for children to have parents and grandparents who encourage their reading, and demonstrate a love of reading, but Wal's generous gifts were more than simply books, they were proof that the outside world places a high value on reading. The brown packages of shiny new paperbacks did a tremendous amount to fuel Helen and Anna's obsession with reading. On the other hand, homeschooled students usually don't have preconceived notions of what is hard and don't automatically groan about the classics, so don't be afraid to suggest them. I do try to focus on age appropriate material, however. Even in the sixth grade, Jane Austen would be easy reading for Helen and Anna, and friends have said their middle schoolers have enjoyed the comedy scenes but not the romance. But I want Helen and Anna to love Jane Austen, so I plan to save it for high school unless they choose to read it. I have steered Helen and Anna away from retellings of the classics, written for children. I have flipped through a few of these condensed, simplified novels, and most are simply dreadful. The reason the originals are classics is because of the writing, not the plot. Jane Austen's plots are recapitulated in every Mills and Boon or Silhouette Romance ever written; it is Austen's use of language that makes her a master. Every classic was once modern, popular literature; it's endured for a reason. Your goal should be developing readers who can cope with the complex sentence structure and vocabulary in these books and poems, not simply giving them a quiz-show familiarity. Introduce classic literature when it is appropriate to your children's reading level and maturity, rather than teaching them that the classics are badly written summaries. If you do want to introduce the stories, it is less damaging to a love of literature to try a different medium ��� David Lean's Oliver Twist film or Odds Bodkin's oral retelling of The Odyssey. Many homeschoolers follow a philosophy of Absolutely No TV. I love television and movies; we often watch them, but we have found it helpful to never offer TV as a solution to boredom. On long ocean passages, we never offered movies, just books on tape. (For the first day or so, we are all a bit too seasick to read.) The only time we ever say, "why don't you watch a movie?" is when Helen and Anna have fevers. They play outside pretty much every day, regardless of the weather. For the most part, sickbed movies excepted, we treat television and movies like books in that we all watch together and talk about them afterwards. Helen and Anna never watched much children's television, either. They never watched television cartoons, and they watch Disney movies at other people's houses. Because we are off the grid so much of the time, we tend to only watch television programs when they come highly recommended from various people, and we've bought the DVDs or the download. This means that we don't have to watch it to a schedule, and it also cuts down on the temptation for boredom TV. We're in it for the stories. Most of Helen and Anna's early television watching was natural history programming (and sometimes opera with my father); after age ten, we began to include more prime time drama, comedy, and many viewings of versions of Shakespeare's plays. I used to tell the children that they couldn't watch a movie version of a book until they'd read the actual book, but I no longer do. In many cases, especially for strong readers, watching the movie first can be a valuable tool, particularly for historical novels. For example, Helen read The Cruel Sea by Nicholas Monserrat the summer after eighth grade, every spare minute for several days. Earlier in the spring, as part of history, we'd watched the movie version, and though the book is far more complex and rich than the movie, she could better imagine the details with the movie in her mind. A 2015 teenager doesn't have the specific knowledge of corvettes, convoys, and submarines that any of Monserrat's readers would have had when the book came out in 1951 and the memory of the war was fresh indeed. Likewise, watching Ang Lee's Sense and Sensibility can help give a picture of 1811 privileged rural England, which Jane Austen's contemporary readers already had. With fantasy, modern, futuristic or science fiction novels, however, I would hold off on the movie versions until after the children have read the books. Anna agrees with me ��� she's read The Hobbit and The Lord of the Rings many times over and disapproves heartily of all the liberties taken in the movie versions. I've spoken to many children and teenagers who feel no need to read Harry Potter because they've seen the movies, and they're missing out. Building a library is our biggest homeschooling expense. I buy a lot of books at second hand shops and buy Kindle books when I can. When we are near a library, we use that. One of the best sources for book lists I've found is Nancie Atwell's students ��� they put their list of 9s and 10s online at the end of every year. There's lists for girls and boys, and it's divided into school years right the way through from first grade to twelfth. It changes every year (and there is overlap between grades, of course). The list can be found online at http://www.c-t-l.org/ kids_recommend.html. You don't have to read every book your children read, but it can be helpful to know a bit about many of them, so you can evaluate whether or not a book is something you want your children to read. A friend gave Helen and Anna The Boy in the Striped Pajamas when we were studying World War II when they were ten and nine. (And it is on Atwell's students' list for fifth and sixth grade, ages 10-12.) I read it and thought it was a wonderful book, but I didn't think Helen and Anna were ready for it. They could have easily read the words, but they would have missed some of the horror of the story, and you can only ever read a book for the first time once. It will hit them a lot harder in high school. In Atwell's experience, "the only gender difference that matters is girls tend to be able to find books on their own. Guys need adult help ��� teachers and parents who make it our business to keep an eye out for good stories for the boys in our lives." Or simply go to Atwell's students for help: her list for older students are divided into boys and girls (although there are many books that appear on both lists, and Helen and Anna in the seventh and sixth grade preferred the boys' list to the girls' list, which they found too heavy on the romance side). First of all, I would give up any packaged or commercial program. When it comes to reading and writing, there are no substitutes for time engaged in the real thing. I'd give up vocabulary study and grammar study, and while I was at it, I'd give up book reports, public speaking, oral; reports, projects, dialectical or double-entry journals, and graded class notes. As far as I can determine, there's no correlation between any of these activities and achievement in writing or reading except for negative effects ��� for example, the time that grammar study takes away from students in their English classes has actually been shown to have a detrimental impact on their abilities as writers and speakers. Atwell also doesn't stock series books in her classroom, but I disagree with this notion. Especially for reluctant readers, the warm bath of a series means that they are instantly engaged with the characters, and may do a lot towards turning them into readers. All the Rick Riordan books or all the Robert Muchamore books count as pages read, and a reluctant reader is far more likely to try something previously enjoyed than embark on something new. If you take a break from school during the year, whether in the summer or some other time of the year, make sure your students are still reading, ideally for the same hour a day minimum. As Kelly Gallagher writes in Readicide, it is vitally important that students continue to read year-round to avoid losing ground. Numerous studies report that as students age, they read less and less for pleasure. In addition, what they do read in school and for pleasure is less complex than it used to be. Hayes, Wolfer, and Wolf analyzed the reading level in school textbooks over the twentieth century and charted a marked decline that paralleled the decline in top-scoring SAT scores over the century (by looking only at top scoring students, Hayes et al have eliminated the argument that scores have decreased because of a larger pool of students). Yet the required reading lists in high school haven't changed very much. The Common Core guidelines suggest The Odyssey, Ovid's Metamorphoses, Turgenev's Fathers and Sons, The Grapes of Wrath, and Macbeth for ninth and tenth graders; Canterbury Tales, Don Quixote, Pride and Prejudice, Crime and Punishment, As I Lay Dying, A Farewell to Arms, Hamlet , and de Tocqueville's Democracy in America for eleventh and twelfth graders. Carol Jago's suggestions for traditional classics include Anne Frank's The Diary of a Young Girl, Romeo and Juliet, Lord of the Flies, Fathers and Sons, Brave New World, The Fall, Beowulf, Crime and Punishment, and The Odyssey. Her textbook for Advanced Placement Literature includes Hamlet, Heart of Darkness, Daisy Miller, and Antigone. Kelly Gallagher describes his inner city high school students reading Hamlet, 1984, The Grapes of Wrath, and Dr. Jekyll and Mr. Hyde. These books are challenging, even to strong readers, to readers who spend many hours a week curled up with a book. Yet, our eighth graders are reading less and less. Is it any wonder that high school students frequently turn to SparkNotes and Wikipedia entries to get the gist of the book and leave the actual words unread? Any wonder that they prefer No Fear Shakespeare to the real thing? The reading level expected of high schoolers has stayed relatively consistent through the years, while the expectations of elementary and middle schoolers has plummeted. Gallegher describes his students reading the first act of Romeo and Juliet as being in "survival mode, simply struggling to understand the text on a literal level." Penny Kittle in her book Book Love: Developing Depth, Stamina, and Passion in Adolescent Readers, says she was inspired to write the book after meeting a former student who had dropped out of the University of New Hampshire. He told her: "I didn't do that well. It was a lot of work, Mrs. Kittle. A lot of reading. ��� I never read that much in high school." Kittle then took informal polls of university professors and her former students, and notes that current college students are consistently reading 100-600 pages a week, and hypothesizes that lack of reading preparation could be a major factor in the oft-cited high college dropout rate. Reading the SparkNotes guide for three or four classic novels a year is simply not adequate preparation for college. It is not enough to score 90% on E.D. Hirsch's Cultural Literacy: What Every American Needs to Know. Mandating a reading list of too-difficult classic or contemporary literature simply means students are gaining a Bluffer's Guide knowledge of faint familiarity, and even if they do read these books, they rarely have a chance to leave "survival mode." There is no more important homework than reading. Research shows that the highest achieving students are those who devote leisure time to reading. ��� Recently, the largest-ever international study of reading found that the single most important predictor of academic success is the amount of time children spend reading books, more important even than economic or social status. And one of the few predictors of high achievement in math and science is the amount of time children devote to pleasure reading. Stamina developed in books students love will prepare them for The Odyssey and Hamlet in high school. Reading hundreds of pages a week in middle school and high school is the only tool that will prepare them for reading hundreds of tough academic pages a week in college. Let them read. The person who reads intelligently enjoys the very important added product of an improved vocabulary, for the proper pursuit of reading, sometimes without it even being consciously evident, is always increasing one's knowledge of words and the uses to which they may be put in order to gain a clearer understanding of what is read. The best way to improve vocabulary is to read. There are plenty of workbooks if this isn't working, but try reading first. The Kindle has a fabulous feature of a built-in dictionary; you merely highlight the word and the definition appears. All through school, I knew I should get up off the couch and go find the dictionary, but I almost never did. Nevertheless, as Carol Jago points out in With Rigor for All, "Children who are readers add between 3,000 and 5,000 new words to their vocabulary every year through incidental exposure." She contrasts this with mere "300-400 words per year that can be taught through direct instruction." We tried the highly recommend Vocabulary from Classical Roots series, but it proved to be busy work, especially as Helen and Anna knew 80% of the vocabulary words already from encountering them in their free-choice reading. Fill-in-the-blank workbooks almost never work for us. I'm not entirely sure I learned any words through studying vocabulary in the abstract. When I was in middle school, I had the good fortune to already know all the words in the vocabulary workbooks, and two teachers who administered placement tests. That was all good. They didn't quite figure out what to do with me afterwards, however, and in seventh grade, my teacher assigned me to read the dictionary (this taught me how to carry on long conversations with my friends without getting caught). In eighth grade, I was told to go off to the library and do the New York Times crossword puzzle (this taught me to hate crosswords and embroiled me as an unhappy witness to a troubled girl setting the rest room on fire.) In neither year did I learn any new vocabulary during class time. My teachers should have given me a book to read. They could have pushed me with an advanced reading list, or just let me alone to read books of my choice, which is how I'd developed the vocabulary in the first place. We can help improve our children's vocabulary by not talking down to them. Even when children are quite little, they will soon learn the words at the limit of our vocabularies. In elementary school, one's spoken vocabulary will likely equal or exceed one's reading vocabulary. (Later on, that may no longer be the case. There are hundreds of words that I struggle to pronounce and use in a sentence, but I have no trouble understanding them on the page.) 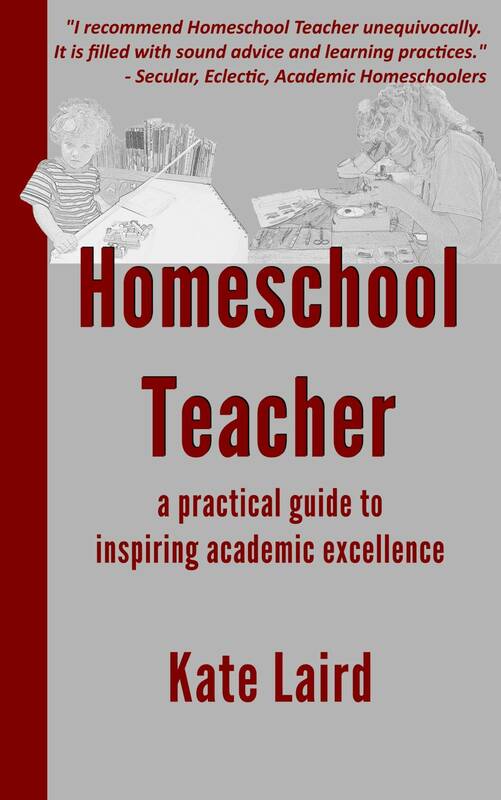 In schools, there are large numbers of students who come from an educationally-impoverished background, without the advantages of a rich spoken language in the home, and teachers work hard to bring them up to the level of their more advantaged peers, but if you are planning to teach your children at home, you need to make sure that your talk at home is as advanced as it possibly can be. At six, Helen was ill with a fever, and a friend brought her over a video of skateboarding penguins to watch. She lasted about five minutes, and sighed. "I don't really hold with this anthropomorphic nonsense." It's a lot easier to say anthropomorphic than it is to read it or write it; and the early elementary years are a great time to learn language (she could be fluent in Chinese or Spanish or Finnish ��� or all three -- if we'd studied it properly at that time). In terms of second language ability, David Sousa in How The Brain Learns asserts that children between three and seven will learn to speak a second language like a native, eight to ten with eighty percent proficiency, and after seventeen with only fifteen percent efficiency. Why is it then that Americans traditionally cram English vocabulary into their heads in preparation for the SATs at seventeen? Don't deprive your children of the full extent of your vocabulary because you think it's too hard for them. Parenting guides suggest that children are unable to comprehend sarcasm. Really? Ours have been dishing it out for years. Sophisticated vocabulary and the advanced ways of thinking don't suddenly become easy at thirteen: it is far simpler to expose your children to these ways of speaking and thinking right from the start. They'll absorb it all easily. True immersion learning is by far the easiest way to learn a language ��� no studying, just repetition by fluent parents ��� and that's as true learning the first language as the second or third. The US Department of Education's Best Practice Guide for Improving adolescent literacy: Effective classroom and intervention practices notes that there is strong research support for the idea of explicitly teaching vocabulary, but then breaks down "explicit instruction" into two categories ��� learning words in isolation (outside of texts) with computer drill (or workbook drill) and learning practices to make students more effective learners of vocabulary on their own. In a homeschooling situation, the emphasis should be on learning vocabulary independently in the context of their reading. In schools, the teacher typically has far superior vocabulary to many of the students; in a homeschooling situation, provided you are speaking to your children with the richest vocabulary you can muster, the playing field is going to be more level. The research appears to support vocabulary drill in workbooks, but then the guide goes on to admit that "Words are usually learned only after they appear several times. In fact, researchers estimate that it could take as many as 17 exposures for a student to learn a new word . . . . [T]he exposures are most effective if they appear over an extended period of time." So you mustn't count on workbooks alone to achieve sufficient vocabulary for your students. That has to come through reading, and better yet, reading with the conscious desire to improve vocabulary by looking up mysterious words and learning in context. Many homeschooling books will tell you to start teaching Shakespeare in middle school. Many bricks and mortar schools have students read Shakespeare ��� often Romeo and Juliet ��� in the eighth grade; it has come to be the mark of a "good school." (And the new US Common Core guidelines suggest Macbeth for ninth graders.) But most of these children have never watched Shakespeare (and many "rigorous" schools won't spend two or three class periods watching it, because that doesn't seem like school work.) Reading a play is hard: it's not meant to be read the way a novel is. Making children read Shakespeare before they've had multiple exposures to the joy of watching the plays is setting them up to dislike it. The easiest way to do it is start with a cinematic version (usually cut down slightly), and then follow up with a version that uses every word (and if you watch it with subtitles, you can even claim that your children have "read" Shakespeare if you are so inclined). There has never been such a good time to study Shakespeare. Dozens of versions of the plays are available for purchase or rent and can be watched at home. (We found many versions were easier to find in the UK, including Trevor Nunn's incomparable Twelfth Night (1990). Software programs such as VLC Media player can cope with the multi-region problem.) Even when Shakespeare himself was on stage, theater-goers didn't have such a wide-ranging access to his works. When your students are strong readers (high school level) and have seen a play several times, Marjorie Garber's excellent Shakespeare After All has substantial essays about all the plays, drawing from historical, social, humorous, and poetic background, to take you much further into understanding the play and appreciating the humor and the language. The third step, which can easily wait until high school, is to read the actual play. Pick one that your children enjoy, and buy the Modern Library edition, which is the version used by the Royal Shakespeare Company, and is usually the basis for the "every word" versions you see in the theater or in DVD versions. The Modern Library editions contain footnotes, but they are not as overwhelming as the footnotes in the Arden Edition, which is better saved for college-level work. (The Oxford Editions are also a good choice if you use an actual print book.) It is best to buy individual plays if you're reading hard copies, but in digital versions the Complete Works can be an economical option. Reading the Modern Library edition on a Kindle makes it very easy to flip back and forth between footnotes and text, and what I find myself doing is reading a page or so of footnotes, explaining the text, and then returning to the text and reading straight through. There is absolutely no need to understand every joke, every reference at this stage. Whatever you do, stay away from Spark Notes' No Fear Shakespeare. This version has Shakespeare's words on the left-hand page, and a "translation" on the right-hand page. No Fear Shakespeare teaches students that they are too stupid to understand Shakespeare and overlooks the point that reading Shakespeare is not about the plots, it is about the language. It was the lark, the bird that sings at dawn, not the nightingale. Look, my love, what are those streaks of light in the clouds parting in the east? Night is over, and day is coming. If I want to live, I must go. If I stay, I���ll die. The horror, the horror. If your children aren't ready to read it in the original, then they should keep watching the movie versions and keep reading other, easier, books and poetry, and tackle reading Shakespeare when they know it better. No one is going to attend to the magic of the words on the left, when the right hand page is so easy and so pallid. As I looked up from the computer to have a rant about No Fear Shakespeare, Helen told me a story about when she had just turned thirteen. She'd been given a gift certificate to Barnes and Noble and went to the bookstore to pick out a book. We'd just watched the 1990 Trevor Nunn Twelfth Night, and she wanted to read it; all she could find was No Fear Shakespeare (this was before I'd heard of it, so she hadn't yet been exposed to my condemnation of it). She flipped through the book, and said she rejected it, because the "No Fear" in the title was "annoying -- why should you be afraid of Shakespeare?" She continued: "All you could see was the translations because they were on the easy side to read." We now have a copy of Twelfth Night which belonged to Hamish at school, and the text is on the right hand page and the notes are on the left hand page. Without Helen's comment, I wouldn't have noticed how we are primed to read on the right hand page, and how much easier it is to read the words of Shakespeare when his words are on the right. But if Shakespeare seems to us in a surprising way so 'modern,' it's because in a sense his language and his characters have created a lexicon of modernity. Our expressions, our way of thinking is informed by Shakespeare, whether we have seen / read his plays or not. His works deserve to be studied for appreciation and delight, not battered through one scene at a time in a mind-numbing marathon of translation. But what about an English textbook? After the success of Susan Wise Bauer's Story of the World series which we used in history, I was keen to follow the rest of her curriculum, set out in The Well-Trained Mind. One of the things she and her mother highlight is the importance of explicit grammar and composition instruction, so we started in with Language Lessons for the Well-Trained Mind by Jessie Wise. I began Helen on the Language Lessons for Grade 3, and Anna on the introductory book for Grades 1 and 2. I think we lasted two weeks with these. None of us enjoyed the time. Both Helen and Anna's spoken grammar is excellent (they've been correcting me for years on me/I, which is sometimes gratifying, sometimes annoying), and so I couldn't see the grammar lessons as time well spent. I haven't memorized the list of 15 Prepositional phrases, and I have survived. Knowing what a preposition and all the other grammar terms mean will make learning a second language easier (I had to learn what all the parts of speech were when I started French in the 9th Grade, and it doubled the struggle). We have met people who have used these Language Lessons and others who have used the Saxon Grammar Program, but formal grammar-only lessons did not work for us. While we were slogging through these grammar lessons, we visited Hamish's school friend, Nick Oulton, then-publisher of the Galore Park series of school books which are aimed largely at the independent (aka private) school market in the UK. He gave us a copy of So You Really Want to Learn: Junior English Book 1 for Year 3, which is more of a mixed approach, with reading comprehension exercises, a sprinkling of grammar, and a concentration on writing. American English textbooks for this age group seem to have an emphasis on fill in the blank answers; English students are asked to write their answers in full sentences right from the beginning. This achieves many objectives at the same time, which always makes me feel I am saving time, and thus, things are going well. The Galore Park text books are reusable for younger children and all the written work is done in a separate note-book. This practices penmanship, grammar, spelling, and working in complete sentences, plus of course, the work on reading comprehension. Each Galore Park book has ten chapters, usually with two excerpts, a grammar lesson, and writing suggestions. I started out assigning the excerpts with the reading comprehension, but gradually gave up. If I could find the whole book where the excerpt came from, I'd assign that, if not I'd skip it (poems and articles are usually reproduced in their entirety.) You could go far towards producing a good library by buying (or borrowing) copies of all the excerpted books, plus all the recommended reading at the end of each chapter. It is probably better for children to meet these books as books, rather than as reading comprehension exercises, although you can certainly use the questions to guide your discussion about the books. As Thomas Newkirk points out in "When Reading Becomes Work," encountering a story in a textbook changes a student's engagement with the writing. The change of venue to school anthologies usually involves surrounding the selection with a teaching apparatus -- comprehension questions, extended writing activities, vocabulary lessons, etc. In this era of No Child Left Behind, any reading passage will be aligned with some reading standard. There is an agenda, beyond the engagement of the reader. The reader no longer feels that he or she can attend to issues of personal interest; rather key ideas are predetermined by the reading skills specialists. Reading is transformed from an experience to a task. It concludes not with that special feeling of literary closure -- but with a set of comprehension assignments. Readers lose the sense of autonomy they experience when reading texts in the original venue, on their own terms. Or as Carol Jago says more succinctly in With Rigor For All: "I hate excerpts." I'd recommend the Galore Park textbooks to any homeschool teacher contemplating purchasing a grammar textbook, and concerned about his or her ability to teach grammar. I realized after a while (too long) that I could teach this grammar more effectively through their writing, but not every parent may be comfortable with that approach, and So You Really Want to Learn English would make an excellent base to make sure the grammar issues are covered. Many of the questions and grammar constructions are very like the mini-lessons described in Donald Graves's A Fresh Look at Writing, and while professional teachers should be able to make sure grammar is covered in context, parents may not be as confident. Perhaps, the true beneficiary of your child working through a grammar book will be your teaching. I certainly found this with spelling. Not only did Anna practice her spelling in the All About Spelling program, but I learned dozens of spelling rules I'd never known, and I was a much better teacher as a result. It gave me the background I needed and the right words to use as I reminded her of the rules each of the fifty times it took for the lesson to stick. 2. Nancie Atwell, The Reading Zone: How to Help Kids Become Skilled, Passionate, Habitual Critical Readers. New York: Scholastic Inc., 2007. Kindle location 158. 3. Ibid., Kindle location 578. 4. Ibid., Kindle location 254. 5. Ibid., Kindle location 1997. 6. Kelly Gallagher. Readicide: How Schools Are Killing Reading and What You Can Do About It. Portland, ME: Stenhouse Publishers, 2009. Kindle location 1238. 7. For a discussion of declining reading through school career, see Thomas Newkirk, "When Reading Becomes Work: How Textbooks Ruin Reading." Independent School Magazine. Winter 2008. http://www.nais.org/Magazines-Newsletters/ISMagazine/Pages/When-Re.... For the relationship between school textbook reading levels and SAT scores, see Donald P. Hayes, Loreen T. Wolfer, Michael F. Wolfe. "Schoolbook Simplification and Its Relation to the Decline in SAT-Verbal Scores." Preprint. Appeared in American Educational Research Journal, Summer 1996, Vol. 33, No. 2, pp. 489-508. http://www.soc.cornell.edu/hayes-lexical-analysis/schoolbooks/Papers/ASpectrumOfNaturalTexts.html [retrieved 31 Jan 2015]. 8. National Governors Association Center for Best Practices, Council of Chief State School Officers Common Core State Standards English Language Arts & Literacy in History/Social Studies, Science, and Technical Subjects. Appendix B: Text Exemplars and Sample Performance Tasks. Washington D.C.: National Governors Association Center for Best Practices, Council of Chief State School Officers, 2010. passim. 9. Carol Jago. With Rigor For All: Meeting Common Core Standards for Reading Literature. Portsmouth, NH: Heinemann, 2011. and Carol Jago, Renee H. Shea, Lawrence Scanlon, and Robin Dissin Aufeses, Literature & Composition. Boston: Bedford/St. Martin's, 2011. 10. Kelly Gallagher. Readicide: How Schools Are Killing Reading and What You Can Do About It. Portland, ME: Stenhouse Publishers, 2009. 12. Penny Kittle. Book Love: Developing Depth, Stamina, and Passion in Adolescent Readers. Portsmouth, NH: Heinemann, 2013. p. 20. 13. Atwell, Reading Zone. Kindle location 2197. 14. William H. Armstrong. Study is Hard Work. Second Edition. Boston: David R. Godine, Publisher, 1995, p. 48..
15. Carol Jago. With Rigor For All: Meeting Common Core Standards for Reading Literature. Portsmouth, NH: Heinemann, 2011. p. 43. discussing the research of W.E. Nagy, R.C. Anderson, and P.A. Herman. "Learning Word Meanings from Context During Normal Reading." American Educational Research Journal. 23:237-70. 16. Discussed further in Isabel L. Beck, Margaret G. McKeown, and Linda Kucan. "Taking the Delight in Words Using Oral Language to Build Young Children's Vocabularies." American Educator. Spring 2003. [http://www.aft.org/newspubs/periodicals/ae/spring2003/beck.cfm] Retrieved 14 Jan 2013. 17. David A. Sousa. How the Brain Learns: A Classroom Teacher's Guide. Thousand Oaks, CA: Corwin Press, Inc., 2001, p. 182. 18. Kamil, M. L., Borman, G. D., Dole, J., Kral, C. C., Salinger, T., and Torgesen, J. (2008). Improving adolescent literacy: Effective classroom and intervention practices: A Prac��tice Guide (NCEE #2008-4027). Washington, DC: National Center for Education Evalu��ation and Regional Assistance, Institute of Education Sciences, U.S. Department of Education. Retrieved from http://ies.ed.gov/ncee/wwc. P. 12. 19. Kamil, et. al. Improving adolescent literacy. P. 13. 20. Marjorie Garber, Shakespeare After All. New York: Anchor Books, 2005. Kindle location 129. 22. Jago. With Rigor For All . p. 74.